“It’s a Jeep thing,” those fun-loving Jeep folk say. While others might not understand, Jeep owners love the attitude that comes with owning these sport utility vehicles: It’s not just a vehicle, it’s an entire culture. 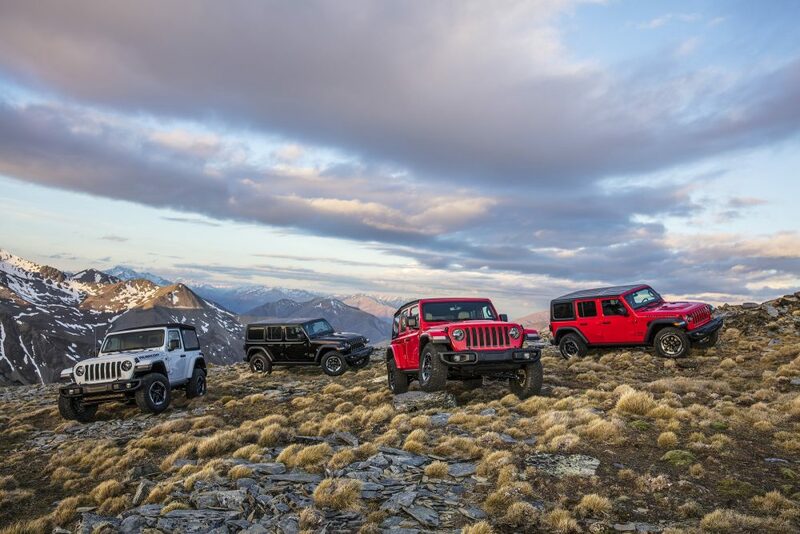 Boasting more than 75 years of legendary heritage, Jeep’s all-new Wrangler builds on its iconic history with a superlative combination of off-road capability, authentic Jeep design, open-air freedom, advanced fuel-efficient powertrains, and superior on- and off-road dynamics. 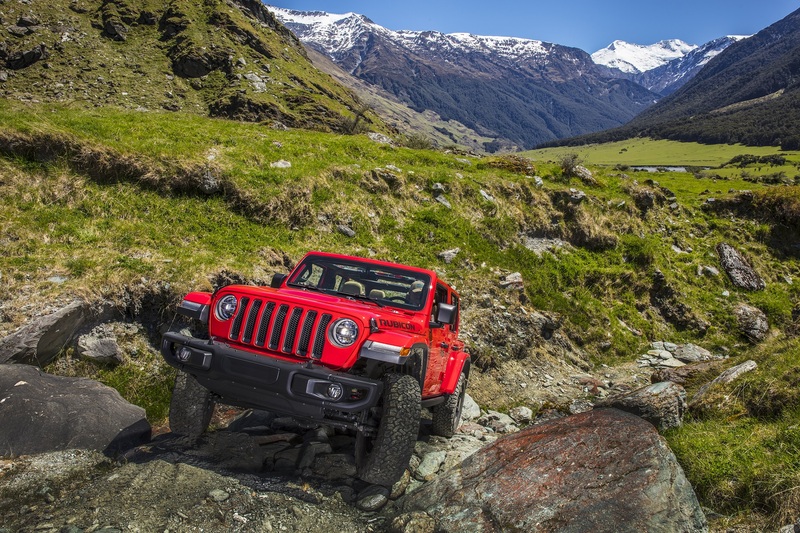 “Jeep has always represented the ultimate in capability and open-air freedom, and our all-new 2018 Wrangler protects that important legacy and takes it into the future,” said Mike Manley, head of Jeep Brand. The 4×4 Wrangler is available in both two- and four-door models, in four different trim configurations: Sport ($27,495 two-door or $30,995 four-door), Sport S ($30,695/$34,195), Sahara ($37,845 four-door only) and Rubicon ($37,495/$40,995). Outside, it still carries its recognizable World War II-vintage shape, from its traditional seven-slot grille and fold-down windshield (because sometimes you might actually WANT bugs and dirt in your face), to its external door hinges, removable doors, and rear-mounted spare tire (with a new security lock system). High-clearance fender flares accommodate 33-inch off-road, all-terrain tires. Wrangler employs four skid plates and bars to protect critical vehicle components — including the fuel tank, transfer case, and automatic transmission oil pan — while on the trail. Dozens of different door, top and windshield combinations allow for endless configuration possibilities. A new half-door design becomes available in 2019. Inside, soft-touch padding replaces the hard-plastic dashboard and trim from a few years ago. Functional features — including climate and volume control knobs, media charging and connectivity ports and Engine Stop Start control — are all sculpted for quick recognition and are within easy reach of front-seat occupants. Standard 12-volt accessory outlets are located throughout, and a 115-volt AC outlet is available to power select three-pronged home electronics. A push-button starter, featuring a weather-proof surround, debuts on the 2018 Wrangler and is easily located within the driver’s reach. “Weather-proof” actually means something here, as the interior is designed to survive not just splashes of water, but a full hose-out if necessary thanks to one-way drain valves. 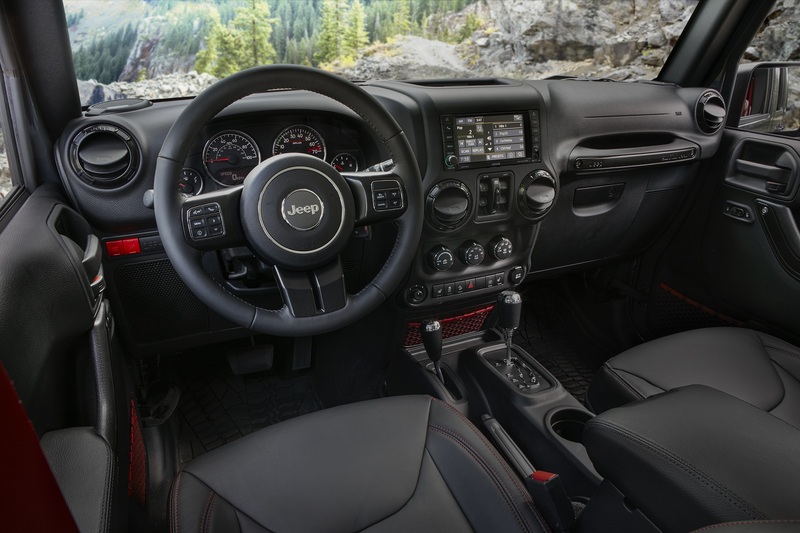 The all-new Wrangler is equipped with the Uconnect 7.0 or 8.4NAV systems (depending on trim) and includes Apple CarPlay and Android Auto connectivity. 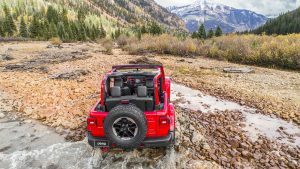 Three powertrains are available: A 3.0-liter EcoDiesel V-6 and all-new 2.0-liter turbocharged four-cylinder join the Wrangler lineup, while the familiar 3.6-liter Pentastar V-6 engine is upgraded for 2018. The 2.0-liter engine touts 270 horsepower and 295 lb.-ft. of torque and is mated to a new eight-speed automatic transmission. The V-6 Pentastar delivers 285 horsepower and 260 lb.-ft. of torque and now features standard fuel-saving Engine Stop-Start (ESS) technology; a six-speed manual transmission is standard and a new-to-Wrangler eight-speed automatic transmission is optional. Due in 2019 in four-door models, the 3.0-liter V-6 (also with standard ESS), promises 260 horsepower and 442 lb.-ft. of torque and is paired with a new eight-speed automatic transmission designed specifically to handle the engine’s increased torque. All options can tow up to 3,500 pounds with the available towing package. I took the two-door, 3.6-liter-powered, manual-shifted Rubicon model off-roading in Malibu, Calif., accompanied by adventure driver Nena Barlow. Her guidance helped me use Jeep’s Command-Trac, Rock-Trac, and hill descent control systems to discover that the 4×4 Wrangler is amazingly adept at ascending and descending steep hills with a variety of soft and hard surfaces, and crawling across deep ruts and other obstacles in the road — in first gear without any fear of stalling. 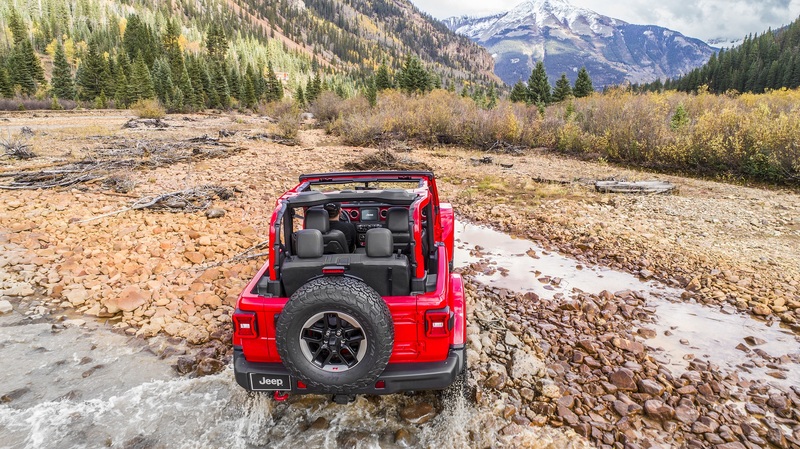 Its approach angle of 44 degrees, breakover angle of 27.8 degrees, departure angle of 37 degrees, and ground clearance of 10.9 inches allow the Wrangler to go anywhere, plus it’s also capable of fording water up to 30 inches deep. And it does all this with surprising on-road ride manners that allow for remarkable day-to-day livability. Key to the Wrangler’s open-air spirit is a host of convertible top options, including a new easy-to-use Sky One-Touch powertop that automatically opens and closes the full-length canvas roof with a push of a button, as well as two hardtops and a new zipperless SSunrider soft top that features sliding retainers for easier rear passenger window removal. 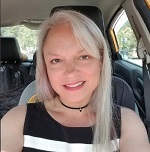 This entry was posted in Automotive Female, Get Off the Road. Bookmark the permalink.